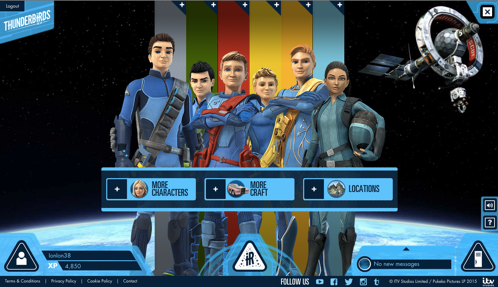 The final part of our Thunderbirds Are Go Blogger Missions were to work our way through the Thunderbirds Are Go Website, and sign up to International Rescue. Another pretty easy mission we thought at first, however we’ve run into a problem – Were having too much fun! 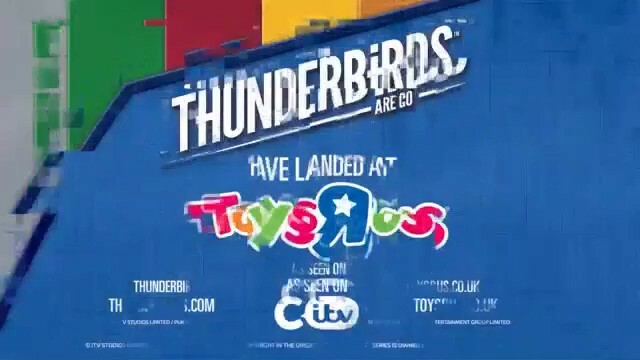 The first thing you do when you log onto Thunderbirds.com is sign up to International Rescue. You get to choose a cool secret code name, and you get a certificate you can print off. 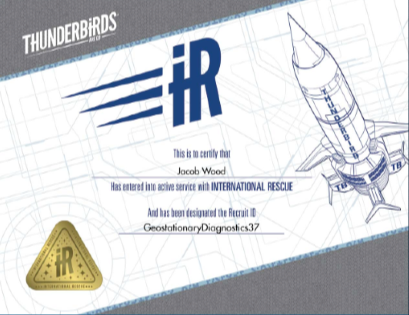 This is Jacob’s certificate, the codename he choose was GeostationaryDiagnostics37. Once you’ve signed up and got your codename the fun really begins as you can start working towards your badges. Theres 14 badges in all you can work towards collecting. You start with the codebreaker badge, as you’ll need the skills you acquire for all the other badges. Each badge has a coded message part, which you have to decipher to continue. The codebreaker badge sets you up for this by having you crack the code. You can then use the code template to work out the secret messages and unlock the next mission badges. Jacob and I recommend downloading the Thunderbirds Are Go app for your phone or tablet if you have one. 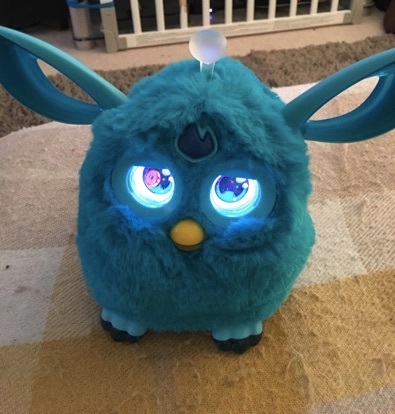 It’s a handy gadget for completing the badges, as it has the deciphered code on it to help you gain your badges, and it makes you feel like a real agent. What’s your username? Do you think it’s cool? Yeah I really like my name, it’s very cool. It was hard to choose a name as they all sounded good together, but I’m glad I choose the name I did. What stage have you got to so far? Me and my mum had such a good time playing we finished all the stages. How many challenges have you done so far? Did you do more than one in one go? Yeah, we finished all the challenges do far. We worked really hard as we wanted to beat the Hood. It feels go to have gained all the badges. Did you find the challenges easy or hard? Most of the challenges were quite easy. 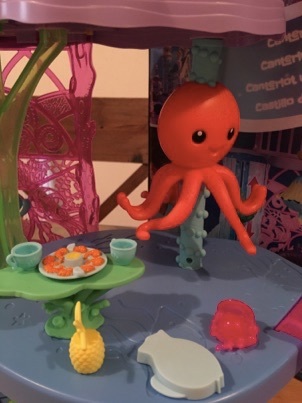 It just took a bit of time to scan the pictures to find all the objects and Hood Challenge pieces. 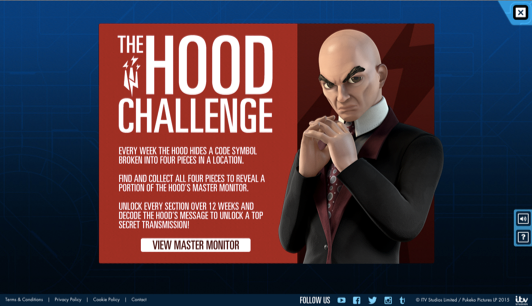 Have you taken on The Hood yet? Yeah, We just beat The Hood. 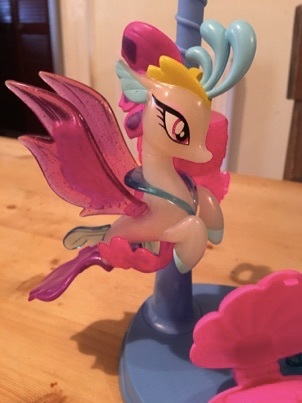 It was great to find all the pieces finally, and see the secret mission video. I think it’s a good website. I like to look around at the the different characters and crafts. Do you think you’ll go back to the website to continue taking the new challenges? I’m definitely hoping that more challenges will be added. It’d be so cool to get my score up and earn more badges. So as you can see we had great fun together on the Thunderbirds.com website, and thoroughly recommend you all check it out. This week the boys and I have been taking part in the Thunderbirds Are Go Blogger Mission. Our first mission was an easy one – to enjoy all of the Thunderbirds Are Go episodes on the new series one DVD. Firstly Jacob was a bit sceptical about watching Thunderbirds Are Go with me, after I told him that I used to watch the original Thunderbirds when I was growing up. I think he thought it was going to be very old and boring, but he was so hooked on the new CGI look. All the old favourites are there like the Tracy brothers, Brains, Lady Penelope and Parker, but the new cartoon look brings everything bang up to date. As part of the Thunderbirds Are Go Blogger mission I asked the boys to answer a few questions about the series. Thomas: Gordon Tracy. I think he looks a bit like me, and he’s loud like me too. Jacob: I like Brains, as he’s always building things and inventing stuff. Thomas: I’m going to say Thunderbird 4 as it’s Gordon’s, and it goes underwater. Jacob: I loved the Bullet Train from the Runaway episode. It goes so fast, and mum said she went on a bullet train in Japan. What would you like to see happen next in the series? Thomas: Another Space episode, maybe a bomb on the International Space Station. Perhaps even The Hood fakes his way as an astronaut and plants it himself. Would you like to see more of a certain character? Thomas: I like Max, Brains’s robot helper. He’s cute. Jacob: Yeah I like Max too. Thomas: Gordon. He likes water like me, and he’s funny. 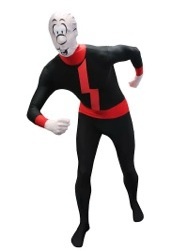 Is your mum/dad like any of the Thunderbirds Are Go characters? The DVD is released in shops on 22nd June 2015, and you can pre-order it now from Amazon, or download the episodes from iTunes. 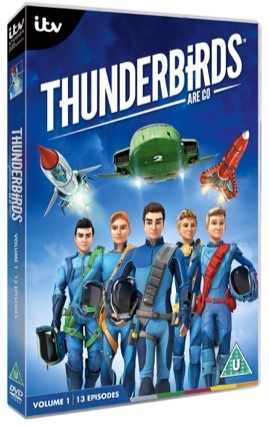 Disclosure: We were sent a copy of the Thunderbirds Are Go on Dvd to write an honest review. All opinions are our own. You may remember last year me taking part in the ‘Cuber In Training’ blogger challenge, with me finally completing the cube in 4mins 16 secs. Well this year that twisty turny coloured menace of a cube turns 40 years old, and to celebrate the anniversary we were kindly sent some more Rubik’s goodies to test. 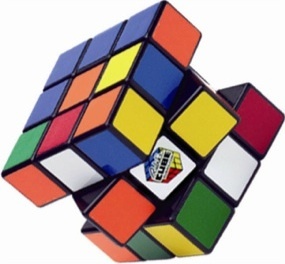 First Invented in 1974, it was in the 80’s that the worldwide obsession with the cube took over. Making the Rubik’s Cube synonymous with the decade as much so as leg warmers and Wham! As a child of the 80’s the Rubik’s Cube will always hold a special place in my heart. In fact it’s the one and only toy I can remember me, my uncles and even my grandfather all trying our hand at. My granddad impartial is still a massive fan, and I often found him trying to complete it all these years later. As well as the lovely old Rubik’s Cube, we were also sent a mini keyring version which is gorgeous, but so small it makes the solving even harder if that’s possible. 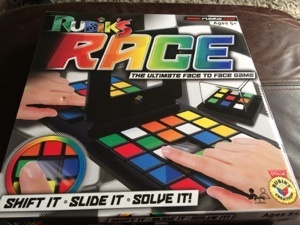 Our favourites though out of our bloggers box was the Rubik’s Twist (which my husband says used to be called the snake) and Rubik’s Race which is an awesome two player game. The Rubik’s Twist has been such a revelation, the kids have been totally glued to it. Fighting over who gets to use it next. 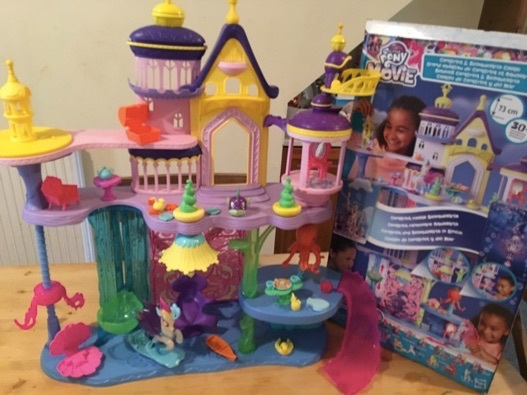 Which has been great, I love that they have been off their gadgets for a while and creating fun shapes with their hands and imaginations. It’s a real brain teaser. Rather than having a single solution, the Rubik’s Twist is made for creativity. It’s basically up to you what you want to make of it. Try to put it back into a circle, making a pattern in the colours, making a shape like a cat or zig zag. The boys have really gone to town and enjoyed the flexibility of not having a pre-determined end solution to aim for. 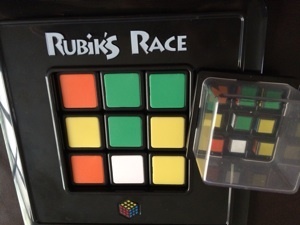 Rubik’s Race is Thomas and I’s new thing to do together during our quiet time before bed. Although we have so much fun it’s maybe not quiet, but it’s something not involving a screen. Each player has a board with 24 coloured tiles (4 of each colour). 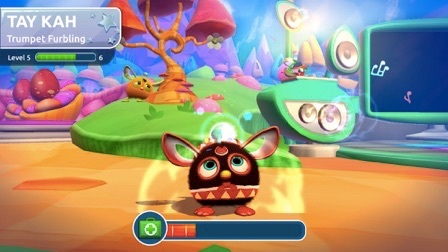 One player shakes the tumbler. 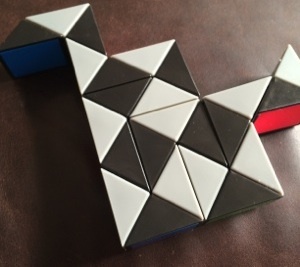 Inside are 9 little coloured cubes, the game is to match the pattern that the cubes in the tumbler make on your own big board. You do this buy moving around the tiles until the patterns match. The first one to match the pattern correctly is the winner. It’s fast, fun, but ever so tricky, and brutal when your one tile away from finishing and your opponent smash’s down his panel to say he’s won. 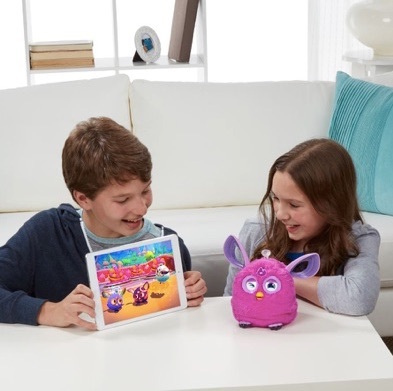 We have had so much fun with game. It’s the best game we’ve played for a long while, and so addictive. 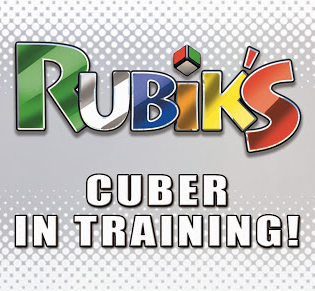 If all this talk of Rubik’s cubes has got you all nostalgic, then head on over to Google’s CubeLab where you can play online Rubik’s inspired games and digital artwork. Thanks so much to John Adams for sending these Rubik’s goodies for us to try out. Fathers Day is fast approaching, you’ve only got just over 2 weeks to get those gifts in. So I’ve been on the hunt for toy related Fathers Day gifts, as we all know men are all just little boys at heart. 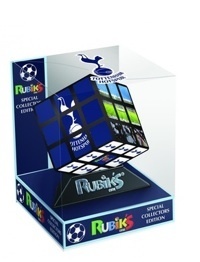 Each cube comes has the club logo, stadium and other club related images on each of the sides. 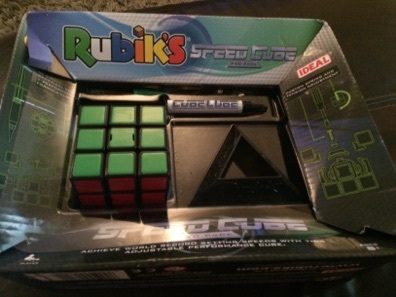 So you can use it just like a regular Rubik’s cube. We tried out the Tottenham Hotspur edition, being big Spurs fans. One side is the stadium, another a big mosaic of the logo, the underside is made up of each cube having a picture of the logo, and the last side is made up of bricks saying “come on you spurs”. It great on its stand, and would look wonderful on your football loving dad’s desk at work. 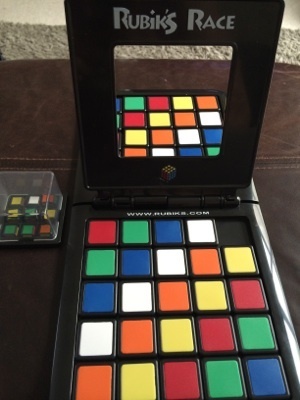 At first I thought it would be impossible to solve without the colours, but I did beat it eventually. I just had to give each side a colour in my head. Sounds weird I know, but that’s the only way I could get my head around the new blocks. I definitely found it harder to solve, so a great new challenge for a footie loving dad who perhaps thinks he’s conquered the cube. My two boys have never been into Peppa Pig, but I know that she and Daddy Pig are big modern kiddie icons. 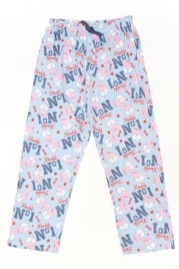 Theres pyjama pants, a t-shirt, No 1 dad trunks, and a range of socks available. One for older more nostalgic dads perhaps. At £39.95 it’s quite pricey for a father’s day gift, however imagine seeing your dad rushing around as Billy Whizz! it has to be worth it for mere comedy value alone. If the Beano is your dads cup of tea then these personalised Beano cups and Beano coasters are just the thing. Coasters are always handy things to have around, and having a pack of six means they’ll be plenty to go around the office, work desk and man cave. 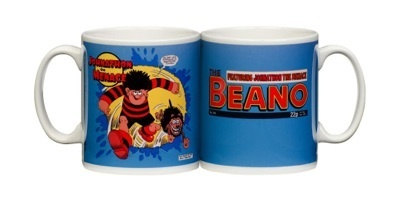 Having a personalised Beano mug is bound to earn them a few high fives around the office too. Another one for the old nostalgics out there. If you’re looking for a sure-fire guaranteed fathers day winner then this has to be it. At only £9.95 it’s a brilliant value for money gift. 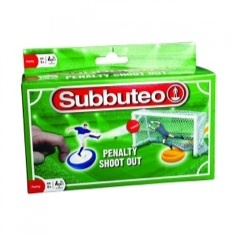 Not for dad’s, Subbuteo will provide lots of fun for all the family. We’ve been testing out the Penalty Shoot out set for a couple of days now and its brilliant fun. Easy to play for even the youngest wannabe footballers, we’ve been having a blast holding our own penalty shoot out tournaments at home. If you’re looking for something that is 100% sure to get dad’s off the sofa and down on the floor playing with the kids then this is a must buy. So that’s my list. Hopefully you’ve found something that’ll take the fancy of the dad in your life. Disclosure: We were sent a Football edition Rubik’s cube and Subbuteo Penalty Shoot Out sent for review. However all opinions are our own. 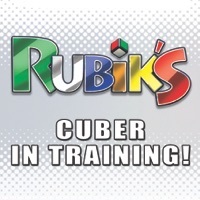 As you’ll probably know by now, me and another couple of bloggers have been taking part in the ‘Cuber In Training’ programme. During the programme we all learnt how to complete the cube, and then battled to see who was the fastest cuber. 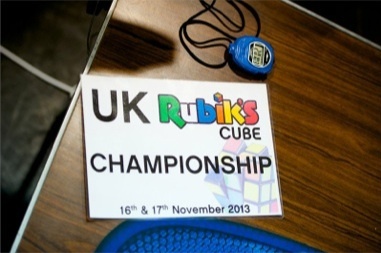 All our blocky fun was done in the run-up to the 2013 UK Rubik’s Championships, which saw cubers from around the world descend on the UK to tackle the 13 different events. Over 100 speed cubers took part in the events, and here are the results. Winner of the 3×3 and UK Rubik’s Cube Champion is Thom Barlow, 25 from Manchester with an average solve time of 10.64 seconds! Winner of the 3×3 Blindfolded is Matthew Sheerin, 22 from Airdire, Scotland with an average solve time of 57.99 seconds! Winner of the 3×3 One-Handed is Robert Yau, 21 from Gulidford, Surrey with an average solve time of 16.24 seconds! Winner of the 2×2 Rubik’s Cube speed solve is Sameer Mahmood from Catford, London with an average solve time of 2.70 seconds! Well done to all the winners, I simply cannot believe those amazing times they achieved. Puts my efforts to shame for sure. Here we are then – Judgement day! All the hard work and training over the last few days has been building up to this. 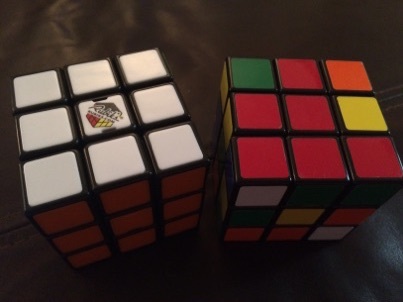 I’ve been driving the family mad with my cubing. First few days because I was just staring at it blankly and getting cross with myself. And now that I can do it, I can’t stop myself. I’ve just been practicing as much as I can. Every minute I can fit a bit in I’ve been cubing. On the bus with my mini Rubik’s key ring, on the way to school, whilst cooking the dinner. I’ve even taken to leaving my cube by the kettle so I can have a go whilst it’s boiling and I’m making the tea. Finally this morning I felt confident enough to start filming and timing myself. I’ve had a few goes – some went badly and I totally lost it, others went better but weren’t as fast as I’d have liked. This is my fourth attempt at the challenge, and I’m finally happy with my time. In fact I’m over the moon with my time. My best time ever and I managed to get it on film! If you want to see how I got on, and more importantly my time you’ll have to watch the video for yourself.